Emus are well adapted to survive in a variety of habitats including woodland, desert plains, shrub land and eucalypts forest as long as there is fresh water nearby. All areas of Australia except the rainforests and areas cleared for agriculture. They are less common in deserts and the far north of Australia. Like ostriches, emus cannot fly. Their tiny wings are only eight inches (20 cm) long and they lack flight feathers the breastbone, or keel, and the muscles needed for flight. However they have very strong legs for running and can reach speeds of 30-35 mph for short distances. They can walk considerable distances at a steady rate of four and a half mph. Their powerful leg muscles and talons are used for defense against predators. Emus are picky eaters preferring the parts of plants that have concentrated nutrients such as seeds, fruits, flowers and young shoots. The rich foods they favor become abundant after a rainfall. Once the food in a specific area has been exhausted, emus often travel hundreds of miles following rain patterns across the arid Australian land. These nomadic birds have an uncanny ability to orient their movements toward areas where the rain will fall. They seem to be attuned to subtle weather cues, such as the sight of distant cloud formations and the sound of distant thunder, to lead them toward areas where rainfall will produce the rich foods they seek. Emus are around five and a half feet tall (1.75 m). Males weigh about 110 pounds (50 kg); females weigh up to 120 pounds (60 kg). Emus have brown downy feathers that droop over their back forming a mop-like tail. They have long legs and dark gray-brown feet with three toes. They have long necks and small heads with bluish skin. They have tiny flightless wings. In the wild: Young shoots, seeds, fruits, flowers, insects and small vertebrates. They ingest large pebbles to help their gizzard grind up food. At the zoo: Greens, mixed fruits and nutritious ratite pellets. The emu is preyed on by dingoes, eagles, foxes and monitor lizards. Emus may be found alone, in small family groups or in large migratory flocks. During the breeding season, females make dull rattling sounds to attract males, while males build nests made of leaves, grass and bark in shallow depressions under cover. After mating, the pair will defend the nest while the female lays a clutch of dark green eggs. Once the eggs are laid, the female will often seek out other males and mate again, while the male remains at the nest incubating the eggs. The same female may return or other females may come and lay additional eggs in the same next, so the male may incubate 15-25 eggs, many of which are not his. Once the male starts incubating the eggs, he will not eat, drink or defecate until the eggs hatch after about 56 days. Some females may stay around to help defend the male on the nest. Once the chicks hatch, the male becomes aggressive and may drive any females away. The newly hatched chicks have brown, black and cream stripes down their backs that help them blend into the grasses and shrubbery of their habitat. Chicks weigh about 14-18 ounces (400-500 grams). They follow the male around for five to seven months as they mature then disperse. This species is fully-grown and capable of reproduction at two to three years of age. Emus can live five to 10 years in the wild and longer in captivity. Emus are the second largest bird in the world. Emus have been present on the plains of Australia for about 80 million years. They were around when dinosaurs walked the planet. Like kangaroos, emus cannot walk backwards. Emus must have daily access to fresh water. One emu egg is as large as a dozen chicken eggs. Emus are raised on farms for their meat. Their skin is used for leather products, emu oil is used to treat injuries, and the eggs are used to create hand-painted art objects. Although emus compete with cattle for grassland and also destroy agriculture crops, they are not currently endangered. An effort to eradicate emus in the 1930’s resulted in the death of thousands of birds, but the species survived. 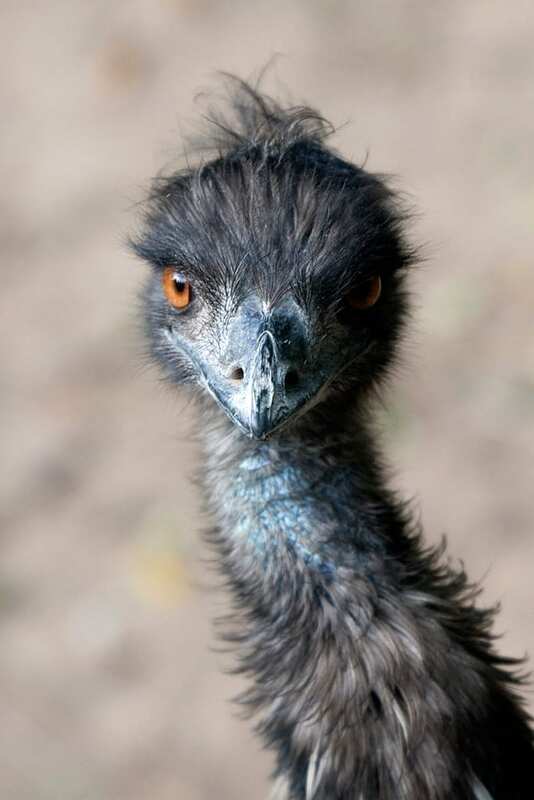 To protect crops, an emu-proof fence was constructed along 600 miles of agricultural land to keep the emus out. These birds are not endangered and in fact have benefited from human activity in Australia. The establishment of watering stations for cattle and sheep has provided permanent watering holes also used by emus. So much of Australia is unoccupied or used as open rangeland that emus still have plenty of room to roam.